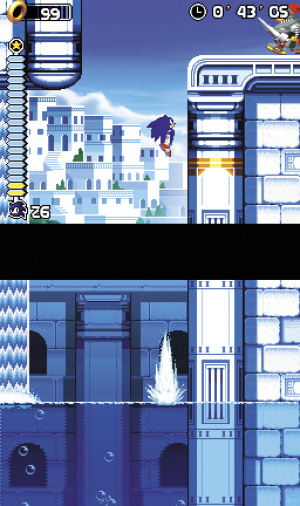 So what does this mean for all those Sonic fans who still feel Sonic 3 and Knuckles was the last great Sonic game? Nothing because this is just as good if not better! 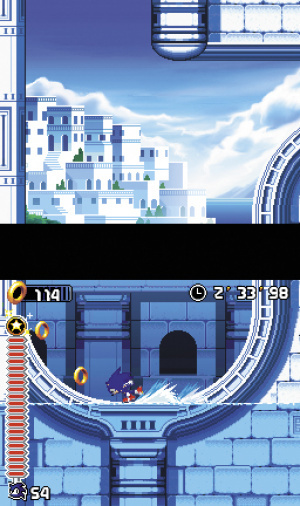 No longer do we have bottomless pits from Sonic Advance 2 or stupid team up moves from Sonic Advance 3 and I wont even mention the 3D games, nope its gone back to basics and by doing that has returned Sonic back to his roots of extreme speed. An interesting story Eggman somehow finds a way to gain access to a parallel universe in which Blaze the cat, a fire elemental with royal lineage, is sworn to protect the Sol Emeralds. The ultimate power said to hold the space-time continuum in perfect balance. By teaming up with his alter ego Eggman Nega, Eggman is able to gain access to these Sol Emeralds and along with the chaos emeralds bring complete annihilation to the world. It’s up to blaze and the unwanted help of Sonic and friends to put a stop to his plans before it’s too late..
Visually Sonic Rush is a really nice game to look at, with 3D character models and lush 2D backgrounds, it really does merge well together giving Sonic Rush its own art style. This really brings out the best in Sonic and the world he lives in. The best use of the DS power is on the boss levels which use 3D arenas along with bosses for you to battle it out with. This is a hot debate by many fans as to whether this new techno sound is better then those of the Megadrive era and I’m all for it as I don’t believe it takes anything away from the series. My two favourite themes that I can’t stop humming to are “zone 4-mirage road” and “extra zone-exception“. 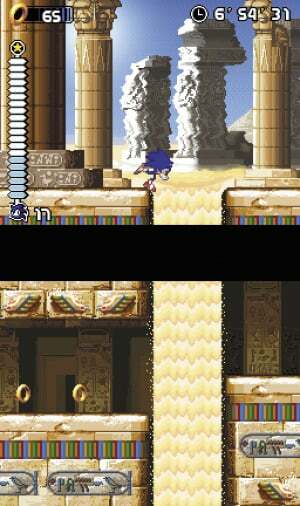 The developers have also kept all the sound effects from previous games, to the relief of the fans. All in all, the music is to a very high standard unlike the voice actors used for all the characters; Tails and Cream especially are still very annoying and simply not needed. Completing the game with both characters unlocks a time attack mode along with a bonus level. Collecting all of the Sol/Chaos Emeralds unlocks the final act and sound test. Not too bad but nothing new for a Sonic game, what will bring you back to playing the game is how much fun you have playing each zone time and again. I'm not the biggest fan of this game to be honest. I found it pretty darned hard. It's been a while since I've played a 2D Sonic game, especially since I grew accustomed to the recent 3D games after Adventure. 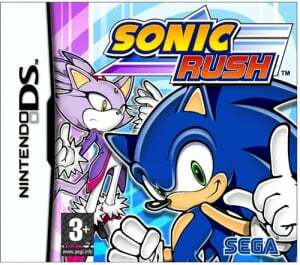 Simply this, Sonic Rush is the best game I've played since Sonic 3 & Knuckles. Sega, Sonic Team and Dimps did an amazing job with Sonic's first DS outing. The game has a fantastic soundtrack by Hideki Naganuma, the same music composer behind the Jet Set Radio games. GET IT NOW! Final Boss was fun(not Giant robot) I'm talking Super sonic blasting through eggman sayin,"Get on my level bro"
Cool. This is the next ds game I'm looking forward to!